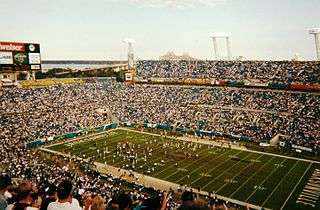 The 1999 Jacksonville Jaguars season was the team's fifth year in the National Football League. Wide receiver Jimmy Smith set a franchise record for most receptions and receiving yards in one season. Smith would finish second in the NFL in receiving yards with 1,636 yards. The Jaguars' regular season record of 14–2 still stands as their best record in franchise history. Both losses during the regular season were to the Tennessee Titans and they lost also to Tennessee in the AFC Championship Game making the Titans the only team to beat them the entire season. The Jaguars received a break in the schedule by not having to face the eventual Super Bowl champion St. Louis Rams during the regular season. Jacksonville defeated the other four teams in the NFC West at the time, including a 41–3 destruction of the San Francisco 49ers on opening day. The Jaguars hired former Carolina Panthers head coach Dom Capers to be their defensive coordinator. Under Capers, the team went from 25th in 1998 to 4th in 1999 in total defense. The Jaguars defense yielded the fewest points in the NFL with 217 (an average of 13.6 points per game). Week 17 against the Cincinnati Bengals. The Jaguars number one defense forced 7 Miami turnovers as the Jaguars won in one of the most lopsided games in NFL playoff history. The Jaguars were up 24–0 after the 1st quarter. The game was so one-sided that the Jaguars were up 41–0 in the 2nd quarter before the Dolphins were finally able to score. The highlight of the game was Fred Taylor's 90-yard touchdown run in the 2nd quarter. This was the last game for both Dan Marino and coach Jimmy Johnson. The Jaguars became the first team in NFL history to lose 3 games to the same team in the same season, where the 3rd loss coming as the home team (every team until this point had lost the 3rd game while on the road). Even though the Titans had 4 turnovers, the Jaguars had 6 which proved to be their downfall. The Jaguars failed to score in the 2nd half, in part due to the Titans defense which forced 4 turnovers after halftime. The game started to fall out of the Jaguars reach when in the 3rd quarter, with the Titans up 17–14, Mark Brunell was sacked in the end zone for a safety. Then on the next play, Derrick Mason returned the kickoff 80 yards for a touchdown, giving the Titans 9 points in just 17 seconds, putting them up 26–14. The Jaguars never recovered. The Jaguars finished the season 15–0 versus the rest of the league, but 0–3 versus the Titans.